Horary Example-Will He Call Again? 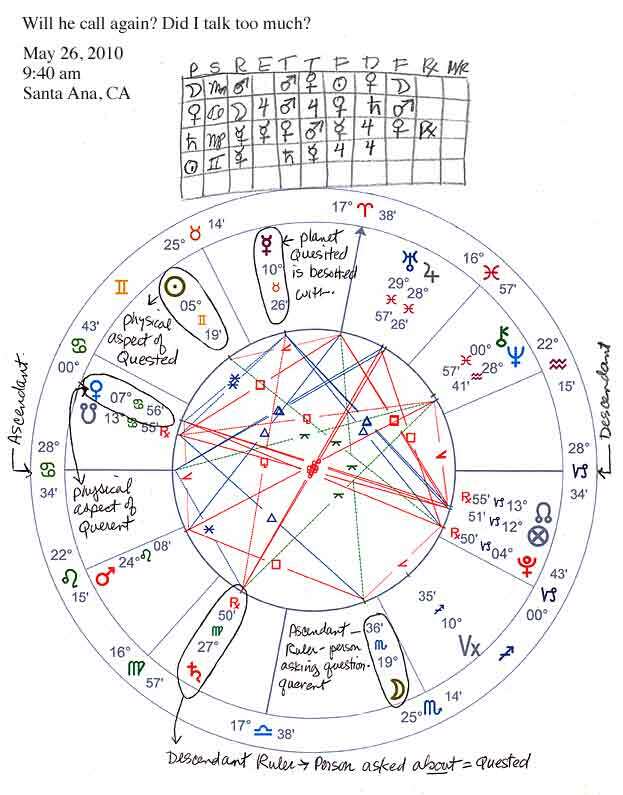 Here is an example of a Relationship Horary Question chart. I have omitted the names of the people involved to protect confidentiality. The person asking the question is always the Querent and the person asked about is the Quested. Even if you don’t understand the astrology symbols, by reading it you could still get a basic idea of how I came to the answer to this question using the Horary chart. Question: Will he call again? Did I talk too much? This question came from a client who had just re-entered the dating world after being married for several years, and is now a single mother, which as we know, does not make dating easy! She wanted to know the answer to this so she could not waste time and move on quickly, one way or the other. The person asking the question is always represented by the Ascendant ruler. Because it’s a relationship question between a man and woman, the woman gets Venus as a co-significator and the man gets the Sun as a co-significator. (Relationship questions for gay relationships have a slightly different procedure, but Horary works just as well for gay relationships too). The graph that you see drawn above the chart wheel is the Table of Dignities. It’s this table that reveals what each person is thinking and feeling based on the sign the planets are in. Each planet operates better or worse depending on it’s nature and the nature of the sign that it’s in. Basically, reading from left to right, it goes from Sign which signifies True Love or Rulership (planet in it’s “own” sign, or showing that the relevant person is “ruled” by the other), to Exaltation (up on a pedestal, basically the first three months of a relationship), to Friendship (maybe it could turn to romance), to Convenient to Have Around, to Indifferent, to Detriment (really dislike immensely) to Fall (exaggerated loathing). The art of it is knowing how to apply this in the context of the question. If you want to know more about how this works, you can Google the Table of Dignities and go from there (or read John Frawley’s books or a number of other books on Traditional Horary Astrology). The Sign of the ascendant tells us what planet represents the Querent as a thinking being. In this case, the ascendant sign is Cancer which is ruled by the Moon, so the Moon is the planet that represents the Querent as a thinking being, or her “head” for short. The Moon is in the Sign of Scorpio, the sign of it’s Fall, which is just what it sounds like. It’s not a good sign for the Moon to be in, which in this case, shows her worry that she somehow messed up the date by talking too much. Scorpio is a water sign, and all water signs are Mute, so we can see right away that she did not talk too much. Venus, which represents the Querent as a physical being, or “Woman” is in Detriment in the sign of Scorpio, so we can see that she is also worried that he didn’t find her attractive because she talked too much, or for some other reason. (We all know that chemistry is non-negotiable, someone is either has chemistry with you or they don’t). It’s interesting to note that he as “Man” falls in the Indifferent box (Face) in the dignities graph, this means she is not particularly attracted to him personally, she is just really in need of some male attention and fun, something that she does not get enough of as a single working mom. Next we look at Venus, the planet that represents her as “Woman”, and we see it is in the sign of Cancer also, showing that her as woman is subject to what her head thinks, exalts Jupiter (Jupiter is exalted in the sign of Cancer) which is intercepted (tucked inside) in the 5th house, the house of romance and fun, and is reinforced by Mars being in Triplicity (showing the level of care or concern as being above average), and Mars also rules the 5th house of romance and fun. Interestingly, her “head” is indifferent to him as “Man” (signified by the Sun). Often people ask questions like to confirm their own gut feeling, she had a sense that this was a relationship that was not going to happen. Now, let’s look at the Quested’s thoughts and feelings about the Querent. The sign on the Descendant is Capricorn, so Saturn is the ruler. Saturn is in the sign of Virgo and is retrograde (shown by the Rx). Mercury rules the sign of Virgo, and Mercury is exalted in the sign of Virgo too. So we see right away that whoever Mercury represents is who he loves and exalts. Saturn being retrograde shows he is thinking of someone in his past, or someone who lives in another state or country (counting counter-clock wise from the Descendant, Saturn is in his 9th house of long journeys and far away places). Then when we look at the Sun, (the Quested as animal man), and we see it is in the sign of Gemini, the other sign ruled by Mercury! Whoever this person is, he’s got it BAD for her! (Mercury). There really is no need to look any further, but we will just for fun. Since she has no feelings for him either, and is really just looking to have some fun, she was only mildly disappointed. It is clear that it’s not because she talked too much or because she is not attractive enough. She was able to drop it immediately from her mind. His planet, Saturn, and, Mercury, the planet that represents who he is longing for, are going to contact each other shortly (Saturn is moving backwards and is at 27 degrees, Mercury is moving forward and is at 26 degrees, Mercury moves faster than Saturn, so will be at the same degree as Saturn before changing signs. He probably went back to his ex. Needless to say, he has NOT called her, and it’s nearly a year later. Read more about Horary Astrology and the kinds of questions it can answer! Ask me to answer your own question.